Recent data show Nevada ranks 50th in the money received from Harry's stimulus bill. That's right -- Senate leader Harry Reid has gotten his own state less help than every other state but one. But one? Huh? If you rank 50th, and one state is worse, that means America has 51 states. Didn't someone involved in this production notice this? Watch the ad for yourself, above. 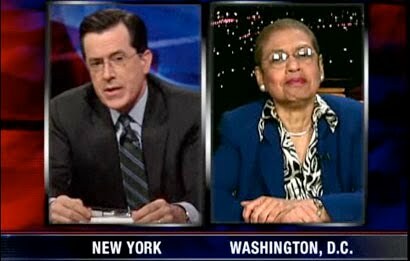 OK, so Washington D.C.'s not a state, but why can't the residents of DC at least get their own senator or member of congress? The most cogent explanation around comes from Stephen Colbert. Watch it here. It's true. Nearly 70 years ago, during WWII, Japan invaded a portion of the U.S. and held the land for more than a year. The location was Alaska, specifically Attu and Kiska islands. The invasion took place on June 6th and 7th 1942. The U.S. didn't put up much of a fight, since most of the island's residents had been evacuated--sort of. The U.S. government had sent the native Aleuts to internment camps on the mainland. Nearly a year later, US forces took back Attu, but the hand-to-hand combat meant considerable loss of life on both sides. 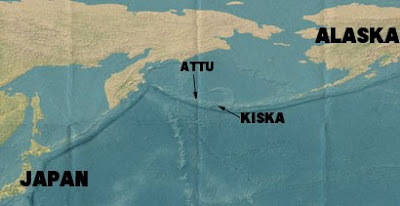 After victory in Attu, the US invaded Kiska, but the Japanese had already secretly evacuated. July 28th marks the 68th anniversary of the end of Japanese occupation of American soil. Love her or hate her, you have to admit that Ann Coulter knows how to get attention. And so when she mentioned that Alberta should become the 51st state, Canadian ears perked up. While Canadian media were all over the story, Americans didn't hear much about this when Ann made her remarks a few months ago. In case you missed it, here is the link. Of course, you can read the full story of Alberta's (and British Columbia's) potential statehood in Lost States. Labels: Lost States, New states? 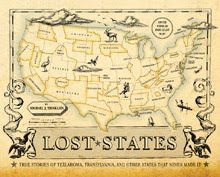 Some "Lost States" movements never die, especially if you can turn them into a tourist event. So it is with Sovereign State of Winneconne, which seceded in 1967 when the city was left of the Wisconsin state road map. Thanks to Steve Prestegard for reminding me that the 43rd Annual Winneconne Sovereign State Days begins this Friday. The events include a parade, lumberjack show, pancake breakfast, and concerts featuring Boogie & the Yoyoz’s, and Power Boys Polka Band. 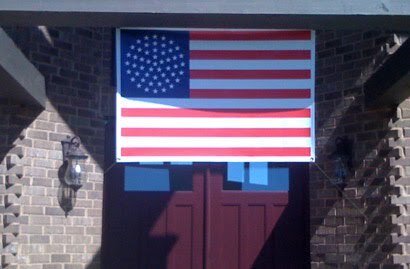 Proof that seceding is fun! (although the logo needs work). Details here. If your summer vacation this year takes you to Yellowstone National Park, you might take a side trip to one of America's oddest geographic anomalies: Lost Dakota. Nobody lives there now... and there aren't even any signs or maps to help you get there. But in the corner of Yellowstone--where Montana, Idaho and Wyoming meet, there was a little patch of Dakota. Lost Dakota gets the full treatment in the book , watch the video above for a quick overview. New U.S. state named "Seven"
Thanks to Mike DeBow for alerting me to a new attempt to create the 51st state. It's the brainchild of Alabama Rep. Mary Moore, a Democrat from Birmingham. She's upset about the possibility that a big employer in her district (a gambling racetrack) might be shut down by the state. Her solution is to create a new state, named "Seven" (because it's the 7th Congressional District of Alabama). It's not just the racetrack issue that has Rep. Moore angry. She and the other members of Alabama's black caucus are livid because the state government "has done nothing for us." In a series of speeches on July 1st, Gov. Bob Riley was called a terrorist, liar, racist and "a wet nurse to Mississippi casinos." I'm not exactly sure what that last insult means, but the imagery stopped me in my tracks. Anyway, the map above shows the location of the 7th district. You can read the Birmingham News report here. While I'm all in favor of citizens working to create new and better states, Mary Moore needs a little branding help. "Seven" isn't a name people can rally around. How about "7-11." It ties in nicely with the gambling angle... and might lead to some corporate money from the convenience store chain. If naming rights for a stadium can sell for millions, think how much an entire state could haul in! Or, if you have a better idea for the new state's name... leave a comment!